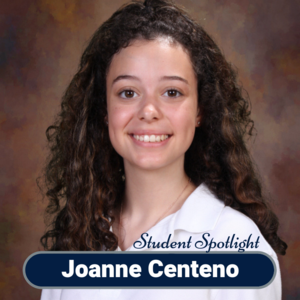 Joanne Centeno (’21) is a 10th grade student who spends her school hours working hard to maintain her honor roll status and spends her after school hours involved in Drama Club, Folio (school online newspaper), and several other volunteer projects. Joanne works as a 4th grade Religion Education teacher assistant in her home Parish of Resurrection. She also volunteers in her Bergen Beach elementary school, PS 312, helping the after school 5th grade Drama Club. Both of these projects began as community service endeavors, but have reached far beyond the required hours. They now reflect Joanne’s passion for working with children, teaching them, and making a difference in each of their lives. Another of Joanne’s passions is singing. As a member of the Resurrection Parish Choir, she sings at every Sunday mass. Recently, she was asked to solely cantor the 5:00 PM Vigil Mass while the Choir Director was on medical leave. It was an honor and a privilege to be given such a meaningful responsibility. Her love of singing has also allowed Joanne to build an extensive portfolio of school and community performances. This past December, Joanne joined the stage at Carnegie Hall as part of the “Christmas In Italy” concert under the direction of Opera Singer/PBS TV Host, Cristina Fontinelli. Proceeds from this elaborate event went to such charities as St. Jude’s Children’s Hospital. Joanne is driven by her devotion to helping children and making them smile through her service and singing.